A great teacher shows you how to reach your goal. Is it easy or hard to get into the class you want? What is the likelihood that you will achieve the academic goal you have chosen for yourself? Should you choose a different academic path? Who succeeds academically and why? Are you getting the results you targeted? Can you achieve what the Admissions Dean asked you to do? Make a positive first impression on an application or interview when seeking future opportunities. Perform on your test in a way that will exceed the reviewer's expectations. Learn what we can do to help you with your academic goals. Since 2002, we have refined preparing students for their qualification exams, helping them gain admission to the programs they want or acquire professional credentialing. Our intent for educating well drove the creation of our individualized teaching approach. Pairing technological advances in courseware with content delivery through the internet to any accessible site, we broadened our spectrum of students. Through rigorous outcomes study we offer you the opportunity to change your test score, and understand your academic goals, as well as your professional aspirations. We may be different from other teaching teams because we offer custom exam review with an element of expert mentorship and guidance. Find your way in the complex grid of educational and preparatory choices by benefiting from the Atclyff advisors. Prepare with confidence and get better at taking your test. Devise a sensible academic plan that works, not only in the short term, but also in the greater perspective. We offer a client-focused, unbiased education advisement with a firm commitment to long-term relationships. Our guidance is outcomes-based with constant monitoring and revision of our academic strategies. We provide teachers with established track-records of getting results for students. Why are students choosing Atclyff? Because they know that the choice is not about selecting the common advisor, but about studying with knowledgeable and current faculty mentors to help them with their important academic goals. We want students' exam review to be effective with services at sites from coast to coast and teachers live online for over 42 tests (standardized and other). We do not use "tips and tricks"; rather, we emphasize helping students acquire the solid foundation necessary for academic success in a short amount of time. Students come to us because their prior teachers did not prepare them enough, and we improve their test knowledge and skills. Learn more about how our teaching team was the first to transform the test preparation industry with innovation in analytics for academic outcomes. Many of our students attend the most selective schools, universities, and colleges. Our program has been designed for students who appreciate legacy. Get started by talking with our test specialists to determine the review you need to prepare well. Provide your student class with the advantage of comprehensive test review to improve competitive performance in contrast to schools which do not offer test review. Our faculty can organize a customized course for your class. We also offer the alternative of training your faculty so that they can teach the course themselves, or adapt their teaching syllabus to incorporate content that will be expected on the standardized exams, thus offering a cost-effective approach to preparing students well. Get started today. Take a free test, it is easy. Call . We've designed a custom program for you. Reach your goal. Prepare faster with academic quick test prep guides. Review with proprietary material for tests. Learn well with interactive lectures for test review. From six-page quick study guides, to multiple original practice tests, Atclyff offers students a variable degree of difficulty practice exams and supplementary materials for more organized and efficient test preparation. On-demand pre-recorded lectures on test content are also available for student review. We provide expert faculty to teach and advise you. demonstrated professional integrity and excellence. Atclyff Faculty include former and current members of the following representative institutes (select of 80): Harvard University, Stanford University, Massachusetts Institute of Technology, University of Pennsylvania, Columbia University, Yale University, Northwestern University, Princeton University, Cornell University, Johns Hopkins University, UCLA, Rice University, UC Berkeley, Vanderbilt University, ETH Zurich, University of Cambridge, University of Oxford, and London School of Economics. The impetus for the Atclyff team came from faculty at Harvard and Stanford Universities who became aware of the concerns expressed by upper class undergraduates who needed advice on admissions or help to prepare for standardized exams. In response, a highly dedicated and professionally advanced group of teachers was structured to provide students with accurate, well-informed, effective, and cost-efficient admissions advisement, qualification mentoring, and test preparation for both on and off campus. In the broad spectrum of exam preparatory services, the members of the Atclyff team elected to focus on custom, individualized instruction, because their experience reflected intelligent application of specialized expertise provided a near optimal return on investment for the majority of the students. During the inception period, we received requests from students of diverse backgrounds, standings, and goals. Some students did not have a full command of the English language, some were individuals who had failed an exam several times after repeat test review with national providers before seeking Atclyff help; others were of high-profile or had non-traditional preparation requests, and some students were average test takers who were not satisfied with workshop size courses and wanted to achieve more. Out of care for our students, we attentively created individualized plans, custom syllabi and curricula, and devised a highly adaptive teaching format (flexible time, site, and level) to promote our students. In conjunction with the dedicated talents of the Atclyff staff, the results in the pilot study were very interesting. The majority of our students succeeded, and that group included students from a broad spectrum of academic tier of training, life challenges, social-economic standing, profiles, and perceived intellectual abilities. Our students became more accurately prepared with training and established a more competent platform for their future professions. The initial success at Atclyff allowed for the expansion of the range of services, national site support, and our most recent expansion to communities abroad. At Atclyff, we became known as the 'complicated case teachers' — because we handle the unusual and complex cases very well—, while we also address the routine cases consistently. Our focus has always been to make students more competitive through integrated pursuits. 1Positive success rate reflects if goals set during initial consult are achieved. Rate includes improved test score, matriculation, acceptance, qualification, and multiple exam performances for broad spectrum of students. These results have been calculated from the last seven years of performance. Range was 96-100%. There is a risk of failure associated with any given instance of taking an exam. The results posted measure past performance for all students who were trained by Atclyff. 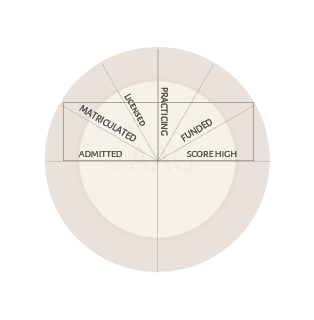 These results do not guarantee that any future student studying with Atclyff will get a perfect performance because each student has unique skills and prior academic training. These results suggest that the group performs well, but individual student performance on diagnostic exams requires monitoring to give the highest likelihood of success on exam. Data sample includes average of multiple tests, e.g. test performance statistically significant increase: i.e. student's prior test score percentile of 27 and actual score percentile of 85, before and after training with Atclyff, respectively, on the 2015 exam writing(s). Building upon forty years of service in United States academia, learning the teaching models that work and observing those that may be data deficient, the founders gathered a core team of top teachers to allow students to work face-to-face with our panel of experts from anywhere there is internet. We focus on student test performance, data-intensive strategy from outcomes-based analysis, risks associated with the educational financial investment, and student individual track records to build a plan for test success and achievement. We offer a Test Diagnostic ClinicTM and free consult to help the student find a suitable format for test review instruction. Our students come from a wide spectrum of track records and abilities including repeat test takers, students with learning or physical disabilities, mature applicants, valedictorians, Rhodes Scholars, and top 1% of the national and international students. We are different from the other test preparation companies because our teachers understand and can advise on both the test and the academic field with a focus on how to make the student competitive in comparison to their peers. Utilizing outcomes-based analysis of academic path progression and test preparation success, we have helped 98% of our clients succeed with their standardized tests, and academic qualification or licensing goals for over a decade. Integrating factors for student level, experience, training history, adaptability, and communication, we have assembled a teaching team that can respond to individual needs and educate students on paths of increased likelihood of success. Due to the variability between student and the external factors, we do not possess a model to predict the outcome for any specific configuration, but our track record suggests that we get good results for most students who seek our assistance. During the initial consult, a faculty member may discuss options and planning factors with the student to ascertain the potential for success before investment in focused test review or admissions assistance. Extraneous quantitative and qualitative fluctuation in variables (e.g. incorrect questions, faulty scoring of test by testing agency, interruption of testing environment, disparities in profiles of admissions committee decisions, etc. ), there is inherent risk associated with test taking and admissions or qualifications advancement. Our track record reflects our commitment to date; we will work with you persistently to increase your chances so that you attain your best score and admissions or qualifications standing. We work with our students to minimize risks associated with extraneous variables by preparing them well. We respect that investment in education is very important to our students and families; therefore, our efforts have always been to protect their interests. To help every student and family seeking our guidance, we offer a 15-minute complimentary, non-judgmental and private consult to informally ask questions and learn about the admissions or academic qualification process. We provide custom instruction with flexible sites, affordable tuition, and a competitive framework. We care about our students, and strive to help them achieve a good outcome on their test scores and academic qualification goals. The advantage to our clients is unique: we focus on the individual as we mentor the student simultaneously. Our dedicated team with faculty (with more than 35 years of individual university experience) serves on a more personal basis than mass-marketed courses, providing discretionary admissions consulting, and efficient and engaging instruction to produce good results. Comprehensive solutions are available for many different types of students who need to find their focus to advance academically. Read more on our site or give us a call, and we will see if we can help the student with a vision for a specific academic goal. Scholarships, joint-degree programs, residencies, internships, fellowships —all potential elements of academic training— should be approached with careful attention to planning and wise investing with lowered risk. Talk to us about your plans, and we'll see if we can help make them possible, and more affordable with Atclyff instruction. For example, in 2016 a senior instructor trained a high school student to score in the top 1 percentile of the nation, helping the student to be awarded a merit-based four-year, ~$200,000 university scholarship. Good results are common and a nice benefit of working with a teaching team who understands higher academia. What does a successful academic path look like? 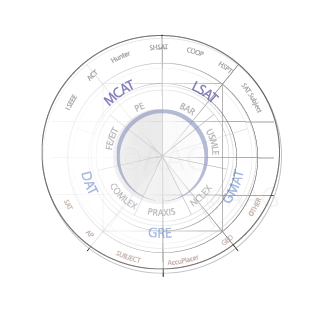 A sample, legacy academic path for education for a pre-medical student from high school to graduate school, continuing on to academic faculty appointment in medicine, is shown in the interactive plot. A legacy path statistically requires excellence, and traditionally evolves from a well-educated family with financial investing means. Many financial, standardized test, admissions, and licensing decisions are needed to advance successfully academically. The extent of advising, opportunity, funding, resources, and chances conventionally varies from student to student. 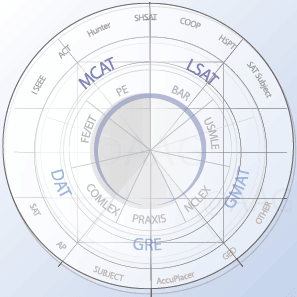 Our team can help you with any or all decision making steps in the process, like the ones shown in the navigation of the complex academic grid to help the student reduce risk of application rejection, or non-competitive test scores, for many of the different professions including law, business, medicine, sciences, and the humanities. Though many educational institutes offer a single or small group of advisors for academic advancement questions, members of our faculty with a data-intensive approach facilitate advisement from observation of national patterns, rather than an institute-specific population. This factor is one of the dominant elements of the value we bring to our students and the often higher likelihood of success. In today's modern arena of academia, the changes since prior generation tests and admissions trends may be pronounced. Working with contemporary advisors who have observed and understood elements of the national and international academic competition can help the student make informed and data-driven choices. It is not extraordinary for families to contact us after investing thousands of dollars repeatedly in test preparation services with other companies with little to no results. We work to identify students we can help, and we apply the expertise of our faculty panel to assist with getting data to make decisions correctly and only once. Hence, we have answers and can provide data for questions, such as the one with a very defined focus, "How do I improve my MCAT score?" the grander question, "What do I need to do to increase my chances of getting into medical school?" and the more long-term question of, "How do I plan spending of funds to become a practicing doctor?" In addition, we provide answers to the non-traditional question, "Do you have a way that I can become a doctor without even taking the test?" We have listened to many students for a long time, and recognize the patterns and paths for high likelihood of success. Investing in your education takes careful planning and spending. Students generally should plan to take a qualifying exam only once and score their best at each stage of their academic progression. Tuition, training, and cost of living, as well as future earnings from salary must all be factored when making decisions about where and when to invest educational funds. Perhaps, you aspire to be an accomplished surgeon with an academic path similar to the one shown in the graph. An informal discussion with an Atclyff faculty member can help you understand and plan well for the costs for training, education, credentialing, applications, licensing, residencies, fellowships, and other faculty requirements. We encourage students to ask questions early in their studies to take the most advantage of strategic educational investing. Making intelligent decisions in your educational investing can have a direct impact on your present and future lifestyle, as well as your legacy. Discussing your questions with an Atclyff advisor gives you the value of working with an experienced, successful faculty member and avoids conflicts of interest. Success starts with the right teachers and mentors. There may be decision making chaos in identifying the right path from a myriad of choices and determining its projected worth. 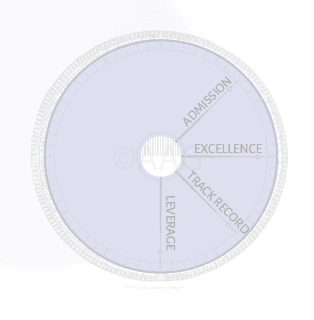 Atclyff provides excellence, track record, and leverageTM for every student taught. Our expertly developed custom review courses help you succeed at your professional goal. With combined established faculty expertise, Atclyff offers a superior quality of courses; you will be able to find a teacher to meet your test review needs while enhancing your plans for academic advancement. Atclyff is one of America's leading standardized test review teaching teams and suppliers of test review materials. Educators and professionals rely on Atclyff to help students with custom review courses to pass their qualifying exams and succeed with their admissions and qualification goals. Atclyff is committed to innovation through continuous improvements in course materials, investment in technology, excellence in teaching, and retention of the highest achieving instructors to train students so that the clients can have a positive outcome. Atclyff's core teaching team consists of professionals who have excelled in the fields of medicine, engineering, education, arts & sciences, and law. Our primary teachers are full-time test instructors with an average of twelve years of teaching experience and scores in the top 1-5% nationally on standardized tests; they have been sequestered based upon their ability to teach and achieve a positive outcome for the students' academic progression. Our secondary teaching and advisement team consists of consultants that include faculty from an extensive educational network across the United States and abroad. We maintain ongoing relationships with a diversified group of educational and professional licensing institutions. Our distinctive strategy helps diagnose the challenges uncovered by a student who is scheduled to test, and evolve a plan by forming a custom syllabus, with original lecture content that meets student's needs in addition to conforming to the official testing agency requirements. Besides providing instruction for 42+ tests from the secondary to professional level exams, tailor-made plans may be requested for academic progression and matriculation. We have taught several rounds of students taking MCAT, LSAT, GMAT, GRE, SAT, and other standardized tests. From teaching the New York State police officers to future physicians and justices, we take great care in providing accurate and contemporary instruction for many different types of standardized examinations. We have focused on efficient review to help students with ordinary and atypical situations. Our successful track record includes assistance to students scoring in the top 1% nationally, improving their scores significantly, overcoming select disabilities, and revamping failed scores from external training. Many of our students attend the most selective universities and colleges. Our outcomes have been over 97% positive for the last decade. We work with the state-of-the-art techniques in web-integrated tools, and our positive outcomes are the result of the precisely combined tools and strategies that include OpenCourceWare materials from institutes such as the Massachusetts Institute of Technology (MIT) and Harvard University, years of admissions committee experience, proprietary testing materials, as well as experience with a wide continuum of students of abilities and academic backgrounds. Atclyff Advisory Group has prepared American and global students for standardized tests since it was founded in 2002. In its 15-year history, the company has expanded with preparation of international students for exams, and publication of review course materials and student test guides —positioning Atclyff one of the preferred leaders in the educational consulting industry—. We have consistently helped students matriculate into degree granting programs and obtain professional licenses. Atclyff, a privately-owned company headquartered in Limestone, Maine with the central administrative offices in New York and Connecticut, prepares students for recurring testing and admissions cycles annually, and provides publications, consultancy, and guidance to the for-profit and not-for-profit educational industries. Dedication to both academic and broader communities includes being trustworthy teachers with high integrity and responsible corporate citizens, optimizing the development and use of resources to have a minimalistic impact on the environment, providing career growth opportunities for our team, and fostering a fair platform in the academic progression of students. •et; and protect our clients' financial investments and future earnings by establishing success at the beginning of their academic progression with ethical use of resources. We care about our students and their wellness. SELECTING THE RIGHT TEACHER and REVIEW COURSE is ESSENTIAL. Getting the matriculation planning element correct to secure educational opportunities and professional development is important. •et; upgrade with admissions or qualification advisement from top national teachers. When to take the test, which test to take, how to prepare for the test, where to apply, what to do with bad test scores, how to select alternatives for study, etc. are some of the inquiries our team can handle very well to construct Academic StrategyTM. We understand the many programs of other national test service providers. Not only do teachers need to be experts, but also should they be able to teach in whatever way students need to learn the material. They need to be engaging. With the right teacher, you may be surprised to find out how competitive you may become. With our knowledge in both teaching and qualification we further productive learning in a fostering environment that meets the requirements of the official testing agencies, the qualification boards, or admissions committees simultaneously. Let us discuss your academic background, preparation to date, testing and admissions or qualification goals, schedule, and budget, and we will see if we can be of some assistance to you. In your complimentary consultation we can advise what services are available through our teaching staff including private tutoring, institution based courses, or directed self-study, in addition to assisting with information for other review course providers, test writing and administration agencies (e.g. The College Board, American Association of Medical Colleges, Graduate Management Admissions Council®, Law School Admissions Council, Educational Testing Service, etc. ), and test review instructors and publishers (e.g. Kaplan®, Princeton Review®, Barron's®, and Peterson's®) to help you decide how to cost-effectively prepare for your test. Whether your goal is to become a cadet at the United States Military Academy at West Point, acquire venture funding as an entrepreneur in Silicon Valley, get accepted into a top medical school or college, obtain a United States medical license as a foreign graduate, be awarded full tuition funding at a private high school, or practice in the fields of medicine, law, or the sciences, we can discuss with you available programs for academic qualification. Our prep service and review course prices start at $45 for application checking, $600 for directed self-study, and $750-2,400 for full private tutoring with admissions or qualification advisement. We offer pay-as-you-go and monthly installment payment plans so that you may make the decision that you are happy and confident with your program. For repeat test-takers, students with learning disabilities such as Attention Deficit Disorder (ADD), blind or visual impairments, who are mature, or with other non-traditional needs, such as improving a prior test score or adjusting for a learning challenge the Atclyff Test Diagnostic ClinicTM is a good place to start learning how to achieve a competitive test score. You can Get Started with a free prior official practice test to help us diagnose your test issues and determine what type of test preparation may best benefit you, or simply give us a call to talk about your academic situation toll-free at . Atclyff professional team focuses on rigorous standardized test preparation instruction, and admissions or qualification strategy with nationally competitive teachers to help you succeed with your academic goal. Our mission is to match you with the right test review teacher and course or advisor so that you will be successful with your professional vision and build upon your family's legacy. For 15 years, we have been following the application and acceptance schedules of students all over the United States, and some studying abroad. Our management team has an appreciation of the admissions process from serving on admissions committees, and knows directly which students achieve admissions at select programs, when, and how. There are many different paths to success, and sometimes, students and their families can provide data that can help students leverage their standing successfully. From chief executive officers and children of families with prized academic legacies, to upwardly mobile families with first generation college students, or families who cannot afford education, we have been having conversations for many years, and understand the academic progression process of different individuals. In our initial consult, we listen to what you want, the class you wantTM to get into, and we will share with you our impressions of what may be possible, based upon trajectories of students with similar resources, activities, and academic achievements. We explain to you what you need to know for your standardized test so that you may perform well, and guide you with applications or qualification requirements. The value to you is that we understand the outcomes of the national testing and admissions cycles, can help you identify an effective strategy, guide you through complex material efficiently, and provide you with mentoring for the professions. Our test instructors write live, interactively customized, and web-integrated lectures, have achieved 97% positive outcomes for a range of student abilities, understand the scope of test preparation materials and courses available, and can help you achieve your goal with intelligent use of your resources. You get the advantage of studying with exclusive material not offered in general large national classes, and an admissions or qualification advisor match more suitable for your specific academic goals. By following the national and partial international outcomes of admissions, qualification, and matriculation, we are in a unique data analysis position to help you make informed decisions regarding strategy for test taking, preparation, application content, and interview elements. Students often inquire about the competency of academic advisors, such as the college, pre-law, pre-med, or other guidance counselors at their schools and institutes. We have observed a strong degree of variability in the quality of advisement, and there will always be the potential for a conflict of interest from an institutional advisor. When you choose to work with the Atclyff faculty, we are focused on teaching you how to be better prepared for academic competition, and how to achieve the goals you set. One of the best advisors is an individual who has completed the career path you are seeking, and is willing to impart the knowledge of possible outcomes with you in a constructive and logical manner. Since 2002, we have cared for our students and always welcome a dialogue. Let us see if we can share some of our understanding so that you can make informed decisions about reaching your academic goals with reduced investment risk. We educate clients on how to use time well, invest where there is the highest likelihood of results, avoid repeat test taking when possible, and simply get done with the goals they set out to achieve.